Ryerson University’s NExT Lab has opened its doors to the public so resolution makers and fitness buffs can kick-start 2015 with the most up-to-date and accurate information about their level of personal fitness. Instead of making wild diet and fitness resolutions you’ll never keep, why not try something different? Like a trip through a Bod Pod, a dance with an ultrasound body composition analyzer; a lazy hour under a domed indirect calorimeter; and a dash on a NASA-calibre treadmill and VO2 Max calculator. “It’s the wave of the future,” says assistant professor and NExT Lab director Nick Bellissimo, of Ryerson’s School of Nutrition. Those tools include precise measures of metabolic and cardiovascular health — to help you figure out what to eat and how to exercise to maintain a healthy body weight. The “Bod Pod,” a giant egg-shaped case a la Mork and Mindy, opens with a space-aged whoosh, and is one of the most accurate ways to assess body composition, Bellissimo says. The high-tech ultrasound, applied with a wand on your skin’s surface, is a more exact measure of fat and lean tissue in each individual muscle — from bicep to quadriceps to gluts. The ratio of fat mass to lean muscle mass you have is a marker of general health, Bellissimo says, and can help predict risk factors for chronic disease, such as Type 2 diabetes. The indirect calorimeter, which measures resting metabolic rate (RMR), is the basis, he says, for calculating how many calories you burn in 24 hours — and how many calories you need to eat each day to maintain or lose weight. While fat mass and RMR are each part of your personal fitness story, Bellissimo says, the treadmill tells the rest. Not only does it measure your heart’s efficiency during exercise — how much carbon dioxide you produce versus how much oxygen you consume — but also what type of fuel you’re burning while you work out. Be it fat or carbohydrates, these figures are vital, Bellissimo says, for choosing the type of exercise that suits you best and will nudge you fastest and furthest toward your fitness goals. “Knowing your numbers,” Bellissimo says, enables specialists, such as dietitians and exercise physiologists, to draw up targeted diet and exercise plans. And, it’s the basis for forming healthier habits — especially for people who aren’t used to working out and might over-exercise in the first few weeks of the New Year. The NExT Lab part is part of Ryerson’s “multidisciplinary” approach to promoting healthy body weight. Bellissimo’s research team untangles the factors that affect healthy eating in children and, because it’s associated with Ryerson’s athletics department, helps athletes improve performance. Helping the public embrace moderation was part of Bellissimo’s motivation for opening the NExT Lab to the public for a few days each week. The full complement of tests costs $300. Or, choose between the Bod Pod ($70), calorimeter ($100) and ultrasound analyzer ($75). Students and faculty get discounts. 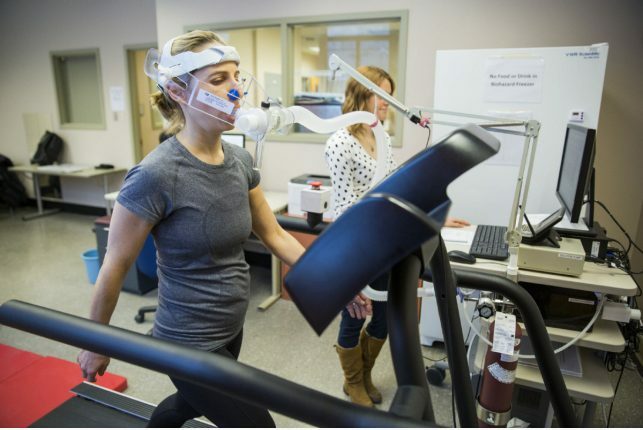 NExT research assistant Kerry Miller, who oversees the lab’s exercise testing, believes arming yourself with personal metrics is a great motivator. Even before you see weight loss on your body, she says, you can be retested and watch as your numbers improve.